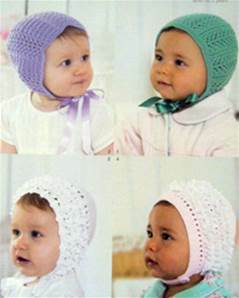 Bonnets, each: 50g Sirdar Snuggly 4 ply, nylon/ acrylic baby yarn. 2.75 and 3.25mm needles. All bonnets except bottom right 1m ribbon, bottom left and right bonnets each 2m knitting-in lace, bottom right bonnet, 1 button.